While most attention has focused on Washington's efforts to reduce our national deficit, officials in statehouses across the country have experienced deep damage from our recession, the worst for state finances in over 70 years. In the last 4 years, our state and local governments have shed over 600,000 jobs. Our current economic slowdown has impacted state budgets in the following ways. Virtually all states are required to balance their operating budgets each year or each biennium. Unlike the federal government, states cannot maintain services during an economic downturn by running a deficit. States occasionally do sell assets to raise revenue; Indiana recently sold its lucrative toll road, but such moves are one time events that ultimately deprive that state of future revenue streams. Furthermore, during difficult economic times, state expenditures increase for such services as Medicaid and state unemployment insurance. Finally, tax revenue falls during these periods of weak or negative economic growth. Several factors have made this slowdown particularly difficult for state governments. 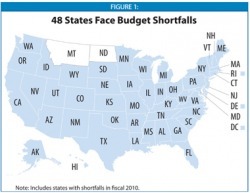 First, many states never fully recovered from the fiscal crisis at the beginning of this decade. State expenditures fell sharply relative to the general economy during the 2001 recession, and for all states combined, they remain below their Fiscal Year 2001 levels. In fact, in 18 states, general fund spending in FY2008 remained below FY2001 spending as a share of gross domestic product. Second, our current economic crisis particularly threatened the sources of state tax revenue. Income taxes fell as job losses accumulated, and sales taxes, which are essential to state budgets, have fallen sharply as consumers cut back on their spending. Furthermore, unlike previous downturns, sources of consumer credit have wilted; as the market for home equity financing and credit card financing are essentially frozen, the consumer is still unable to borrow in order to keep spending. Finally, unemployment, which peaked at 6.3% in our last recession, continues to remain relatively high at 7.8%. Now states, dependant on federal grants as never before, face the prospect of lower levels on federal monies due to our deficit reduction efforts.. This brings us to state spending on health care. At least 22 states have already implemented cuts that will reduce access to health care services. For example, TennCare, Tennessee's Medicaid program, eliminated hospitalization and other medical services for an estimated 30,000 to 40,000 individuals. While Nevada has eliminated some services for pregnant women and capped its SCHIP program for children, California cut its SCHIP program and has reduced the services covered by Medicaid. New Jersey has cut state funds for hospital charity care while Arizona is actively working to reduce its Medicaid rolls. Rhode Island has reduced the maximum income level at which parents qualify for state health insurance from 185% to 175% of the federal poverty level; thus eliminating coverage for approximately 1000 low-income families who have very little hope of affording commercial insurance, and Utah legislators have cut funding for services such as physical therapy and vision care for adult Medicaid patients. South Carolina is now limiting coverage for many medical services such as routine physicals and physician visits. Finally, Utah, Illinois, California, Florida, Georgia, Maryland, Minnesota, New Hampshire, New York, South Carolina, and Virginia have already announced reimbursement cuts or have frozen reimbursement for health care providers. Illinois, for example, is lengthening the time it takes to pay provider claims while California has significantly cut provider payments. Despite all of these cuts, Medicaid remains states' biggest financial worry. Medicaid continues to consume 24% of states' spending; it is states' largest budget item. 10 states are already over budget for this fiscal year, the largest budget hole is in Texas where Medicaid is over budget by a whopping $4.3 billion. At a time when states are eliminating jobs and cutting services of all types, we cannot expect them to treat their health care spending as sacred and untouchable. While it is very unpalatable, we should vigorously encourage our state administrators to reduce reimbursement before reducing health care access to the poor and vulnerable members of our society. From an economic point of view, receiving less reimbursement from a stable number of Medicaid patients will mean essentially the same revenue to our practices as receiving somewhat higher reimbursement from a smaller number of insured patients. However, from the vantage point of the health of our patients, there is a tremendous difference between being insured or being uninsured. The statistics regarding the health costs of being uninsured are staggering: women with breast cancer are 50% more likely to die of their disease than women with insurance, it is estimated that one third of the uninsured forgo needed medical care every year, and up to 10,000,000 Americans go without essential prescriptions every year. To further illustrate the plight of the uninsured, the American Medical Association has created a website, voicefortheuninsured.org to augment their proposal to provide health coverage to every American. Therefore, as we are a society that advocates first and foremost for the good of our patients, we believe that states must keep Medicaid as accessible as possible even if this means some reduction in our reimbursement. This strategy will have negligible effects on our practice revenues while significantly improving the health and lives of the patients who are kept insured through Medicaid. We all wish that no Medicaid cuts were necessary; however, as outlined above, they are inevitable, and we should be sure that these cuts are done in such a way that is as protective of our patients as possible.